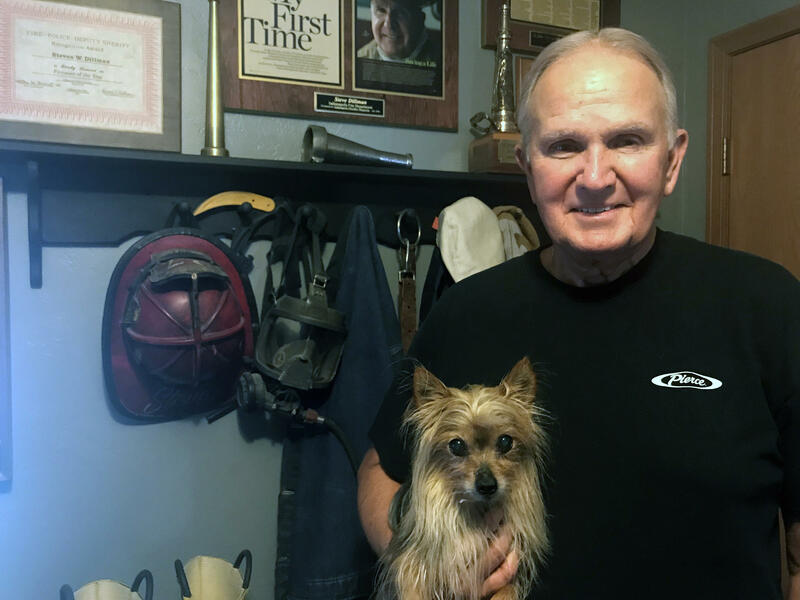 Steve Dillman, holding his 11-year-old yorkie Colt, stands in front of some of his old firefighting gear. The 74-year-old spent 38 years as an Indianapolis firefighter, and was diagnosed with prostate and throat cancers, most likely due to his profession. Newspaper articles from the Indianapolis Star on Aug. 2, 1985, detail the fire at the American Fletcher National Bank Warehouse. 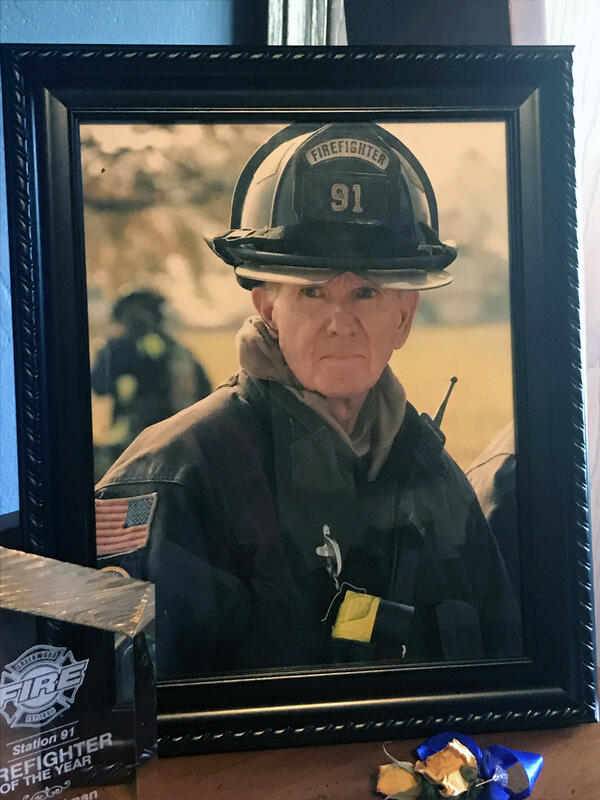 This is one of several photos in Steve Dillman's Indianapolis home that show his life as a firefighter. That’s when Indianapolis Fire Station 11 was dispatched downtown. The American Fletcher National Bank warehouse was on fire. Dillman and the rest of the firefighters noticed something strange and painful after they put the flames out. Everywhere they sweated – under their arms, around their groins – their skin peeled. Dillman and 18 other firefighters were hospitalized, according to stories about the fire in the Indianapolis Star newspaper. The warehouse was filled with boxes treated with a flame-retardant chemical. Dillman said the Indianapolis Fire Department later learned the burning boxes sent toxic gases into the air, including formaldehyde, a known carcinogen. Dillman was diagnosed with prostate cancer 16 years later, and throat cancer seven years after that. In fact, more and more firefighters across the country are being diagnosed with cancer every year. Research shows firefighters are diagnosed with and die from cancer at higher rates than the general population. As studies continue, more cancers are linked to firefighting. “It’s just an evil thing that we have to deal with,” 74-year-old Dillman said. In response to rising cancer rates, Indiana and more than 30 other states have enacted what are called presumptive laws, according to the First Responder Center For Excellence, a nonprofit that supports the National Fallen Firefighters Foundation. Broadly, these laws say firefighters who are diagnosed with cancer while on the job or within a certain time after retirement are presumed to have become ill because of their work. It varies state by state which cancers are covered by the law and how long after retirement a cancer diagnosis can be linked to firefighting. Lawmakers and presumptive law advocates argue that because the cancer is connected to firefighters’ careers, their treatment costs should be covered by their employers. But many firefighters and their families have learned presumptive laws don’t guarantee health care coverage after a cancer diagnosis. In 2013, the Centers for Disease Control and Prevention published findings of a multi-year study on firefighter cancer rates. Researchers found firefighters are exposed to contaminants from fires that are known or suspected to cause cancer -- everything from asbestos in old buildings to the diesel exhaust from fire trucks. Firefighters are more likely to develop respiratory, digestive and urinary system cancers, according to the government study. The rate of mesothelioma, a cancer linked to asbestos exposure, is two times greater in firefighters than the general U.S. population. The study had its limitations. Researchers recognized that few women and non-white firefighters were included in the sample size. Still, the findings are reflected locally. At least 84 active Indianapolis firefighters had a cancer diagnosis as of last year. At least 84 active Indianapolis firefighters had a cancer diagnosis as of last year, according to the most recent Indianapolis Fire Department records. Those diagnoses encompassed 14 different types of cancer, the most common being prostate, skin and lung cancers. Of the 2,300 firefighters in the Indianapolis Professional Firefighters Union, 200 have disclosed they have cancer or have had cancer while on the job. That’s according to statistics the Indianapolis Professional Firefighters Union Local 416 started collecting this year. Firefighters can decide whether or not to share their cancer diagnosis with the union, so its leaders estimate the actual number of cancer cases is probably much higher. "A lot of people don’t want it to be known, so they keep it quiet,” said Hank Harris, president of the Indianapolis Professional Firefighters Union. The CDC will continue to collect national data on firefighter cancer rates under the Firefighter Cancer Registry Act, which President Donald Trump signed in July and firefighter advocates say will support the research that links their work to cancer. “By focusing on collecting the data on firefighters who are out there doing this work every day, it should become very clear to the legislators and those controlling the purse strings that we need better protection for firefighters,” said Jim Brinkley, director of occupational health and safety for the International Association of Fire Fighters, a Washington, D.C.-based lobbying organization. Cancer wasn’t a word spoken in firehouses when Tom Hanify joined the Indianapolis Fire Department 37 years ago. But the president of the Professional Firefighters Union of Indiana said firefighters knew their job was dangerous. “As one crotchety old firefighter said, ‘Tommy, this job’s going to kill you fast and you're going to be a hero, or it's going to kill you slow. But for sure, it’s going to kill you,’” Hanify said. To decrease that risk, the IFD and fire departments around the country want to prevent exposure to carcinogens and enact laws that protect firefighters who do get cancer. States like Indiana and Ohio have passed laws that, in theory, should extend full health benefits to firefighters who are diagnosed with cancer while on the job or within a certain amount of time after retirement. In many states, the law also covers police officers and other public servants. But a cancer diagnosis alone isn’t enough to trigger a presumptive law’s protections. Indiana’s law states cancer claims can be “rebutted by competent evidence,” though evidence to deny a cancer claim is not specified. And the law only determines if the firefighter’s cancer can be linked to their work. It doesn’t affect whether that firefighter is eligible for disability benefits. Brinkley said the International Association of Fire Fighters has found that “almost categorically,” workers’ compensation systems across the country are denying that firefighters’ cancer diagnoses are directly related to their work. Before Indianapolis firefighters with cancer can be sure their health costs are covered, Kevan Crawley must first submit a claim that answers a few basic questions. Has the firefighter used tobacco products within the past five years? If they have, they are automatically denied cancer coverage, which is the law. The city also wants to know the specific fire that led to the cancer diagnosis – how the firefighter “caught cancer,” as Crawley put it. But Indianapolis firefighters haven’t kept good records of what chemicals they could have been exposed to at fires, union leaders said. Brinkley said that’s true of firefighters nationwide. Dillman’s throat cancer diagnosis came seven years after he was diagnosed with prostate cancer. He had his prostate removed, and 37 radiation treatments. He remembers the department covered most of his health care costs after his first diagnosis. He was diagnosed a second time a year before Indiana passed its presumptive law in 2009. By then he qualified for Medicare, which covers most, but not all of his treatment. Science also doesn’t back the claim that just one exposure to a carcinogen can be linked to a cancer diagnosis. There isn’t definitive research that shows cancer comes from particular events or a career of exposure, said Dr. Jefferey Burgess, an associate dean at the University of Arizona who has been researching firefighters and cancer for more than 25 years. “Every fire tends to have these chemicals, and therefore it should just, from my mind, be a question of whether you’re a firefighter and you've gone to fires rather than documenting that a specific fire that was a problem,” Burgess said. The time limit on a cancer diagnosis is also problematic. Indiana’s presumptive law only extends five years after retirement, but cancer can develop "anywhere from less than 5 years to over 30 years” after exposure, Burgess said. These benefit regulations also affect a firefighter’s family. If a firefighter’s death can’t be attributed to a specific fire, they aren’t eligible for line-of-duty death benefits. “Not only have they lost their loved one, but now they have to figure out financially how do they recover from this, because they’re saddled with the expensive medical bills that were not covered by the city that the member was protecting in the first place,” Brinkley said. In Indianapolis, claims of workplace injuries are submitted through Broadspire, a third-party administrator that approves or denies requests for insurance coverage. A Broadspire spokeswoman said in an email that the company won’t comment on how it manages its clients claims. Brett Wineinger, risk manager for Indianapolis, oversees the city’s insurance policies. said the city and Indianapolis Fire Department have discussed national cancer trends, and that few of the claims of line of duty have dealt with cancer. The process of approving or denying claims, Crawley said, can take months. That’s stressful for firefighters waiting to see what care will be covered and what costs they may have to pay out of pocket. Those stressed out firefighters often end up in Crawley’s office. Sometimes they even call him in the middle of the night. “You have guys you’ve looked up to in your career and you don’t ever expect to see them in a moment of weakness,” Crawley said. Doctors told Steve Dillman his throat cancer came from smoking. He knew it didn’t. “I thought it had to be job related because I’ve never smoked a day in my life. I don’t chew. I don’t drink excessively … and that’s the three main criterias,” the cancer survivor said. It’s true. Dillman never smoked cigarettes. But he did spend 38 years as an Indianapolis firefighter. Dillman calls firefighters “a rare breed.” When people run out of burning buildings, firefighters run into them. They were called smoke eaters, Dillman explained, and they wore their charred, soot-covered gear as a badge of honor. But on the scene of a fire, Dillman didn’t wear his self-contained breathing apparatus, or SCBA. No one did. If you did you were a “sissy,” Dillman said. “It was just the way the job was,” Dillman said. Procedures during fires have changed since Dillman retired in 2005. It's now standard practice for firefighters to wear their SCBAs the entire time they’re at a fire. The Indianapolis Fire Department also created a report firefighters fill out after any incident that could have exposed them to cancer-causing chemicals. But firefighters, like Crawley, Hanify and Harris, hope it won’t be the way the job is in the future. Because they say they can’t rely on the state’s presumptive law to protect Indiana firefighters, they are focused on what is in their control – preventing cancer. Dillman now travels to fire departments around the state to urge firefighters to use their SCBAs and practice other preventative cancer measures. He knows the equipment is heavy. He knows firefighters who don’t use their equipment want to look tough. But he also knows none of them want to go through what he did after two cancer diagnoses. To make his point, Dillman brings a SCBA and the oxygen machine and the mask he needed to breathe when his cancer was at its worst.